I was in Powell's, I say, and walking through the philosophy section, I felt a dreary hopelessness. ... Books used to be enticing. I used to look forward to them with an insatiable appetite. But now they're oppressive. Seldom, seldom does a book take me anywhere new, now. I read a few pages of a "new" book and it's just an old book ... it's old characters in the new settings, and they wander through old stories like forgetful old men, their pasts more vivid than their presents. Supposedly factual books are just the same -- the same tired old narrators, the same rhetorical moves. I know them all already. I've devoted a big chunk of my life to learning through and around and about books. I know how to make books talk to each other, illuminate each other, and even how to use books to make new books. And frankly, that knowledge has been pretty important to who I am at certain times in life. So those words sound so heretical to me, at first. But I've spent long hours in Powell's, over many decades now, feeling a nagging emptiness as I browsed the long, vast shelves. And what Dale describes may well be what I was feeling. So I wrote this comment. Dale can sound pretty universal sometimes, but the texture of this meditation comes from the texture of Powell's, a cavernous bookstore, larger than most public libraries, where new and used books are intershelved. 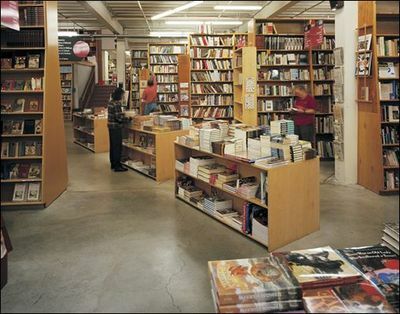 At times Powell's seems like Portland's bustling temple of culture, but however busy it may be on a Sunday before Christmas, you can wander up into a distant room and be quite alone among long, tall shelves of one topic -- Czarist Russian History or Gothic Architecture or Chess Openings. In such moments, one's only company is in the mutterings of all those lifeless books, like millions of homeless people each explaining how he was robbed, demanding their rights from the wet, soft silence. It's the used books that give Powell's this anxious quality. Your typical new-book store is much more compact, so you aren't as likely to be left alone with a long row of books. And new books are too young to be bitter. They get touched, shuffled, rearranged. They call from the shelves in the clear, strong voices of youth. It makes the store a little noisy, but you know your way around. If you doubt it, just grab Calvino's If on a Winter's Night a Traveler (always in print) and flip to Page 5. In the shop window, you have promptly identified the cover with the title you were looking for. Following this visual trail, you have forced your way past the thick barricade of Books You Haven't Read, which were frowning at you from the tables and shelves, trying to cow you. But you know you must never allow yourself to be awed, that among them there extend for acres and acres the Books You Needn't Read, the Books Made For Purposes Other Than Reading, Books Read Before You Open Them Because They Belong To The Category of Books Read Before Being Written ..."
Books read before being written. Even today, decades later, a typical Barnes & Noble or Borders can be caught organizing its Books You Haven't Read by exactly these categories, especially during the holiday season. But back to Powell's. Wandering down a long, long shelf of books on Urban Planning or Gay/Lesbian Literature, I see the occasional new book, but it's far outnumbered by the legions of its resentful elders. Books that were tremendously important in their day, some of them. Books that once mattered to me. All of them now Books I Needn't Read. And while I can walk past a shiny new Book I Needn't Read without a pause -- those old Books I Needn't Read seem entitled to some vague respect because of all that they did, or might of done, or honestly hoped to do. Old books in bookstores are more needy than old books in libraries, which have already found their place. And of course there's the possiblity that something transformative and liberating is scribbled in the margin of page 286 of that one over there, or that if I took this one for a walk, the cute guy in the cafe might turn out to be the author's son, and he'd be so intrigued / pleased / appalled to see someone reading dad's book that he'd strike up a conversation that would change my life. So I tend to pause, run my eyes too many times over their arrayed spines, reflect too often on what a great place this store is, and then wander off, never quite saying what Dale has said just now. ... to emerge, bang, in the city. I catch quick glimpses of the celebrated hillsides, but soon the bus deposits me at the roiling central terminal on Avenida Manuel Montt, a raging, asphyxiating, toxic gash that would fit most stereotypes of "Third World Prosperity." Looming above it is the Arch, seat of the Chilean Congress, an overpowering Modernist 20-story slab with a great square hole in the center. Surrounded by high fences and guarded by the ever-stern Chilean police, it is utterly wrong for its site. The prosperity of storefronts declines noticeably as you approach it. Popular guides to Valparaíso mention it only in passing. One calls it imposing (imponente) a universal guidebook code-word meaning "big and unpleasant." I know the Arch is wrong even before I know of its fascist provenance. But indeed, this monstrous cube is the last architectural gasp of the dictator Augusto Pinochet, perhaps the last of his many atrocities. Pinochet conceived this imposing box/monument/prison for an irrelevant Congress that he wanted to keep out of Santiago so that he could dictate in peace. Today, the talk is all of abandoning this building, though it is hard to imagine how it could be re-used except as a monument to the horrors of the Pinochet regime. Perhaps it has enough rooms that one could be devoted to the memory of each of the 3000 or so people who "disappeared" under his rule. Fortunately, I can look away. It's 2 AM. Do you know where your escalator is?